Sometimes it seems that no matter how hard you work out, how many weights you lift, how many arm fat exercises you do, or how many diets you go on, the weight in your arms refuses to go away. The rest of your body might be progressing well, but the arm fat is stubborn. Why is arm fat so difficult to get rid of? 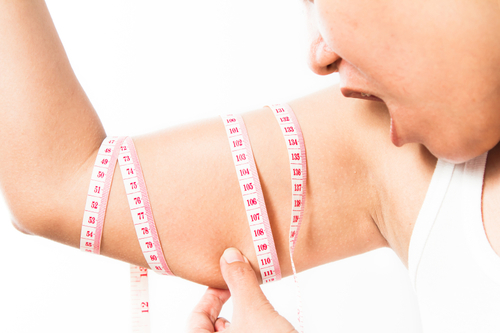 Summer can be a tough season for people with arm fat because everyone wants to wear tank tops, sleeveless shirts, or dresses, but extra fat on the arms can make one self-conscious. Women typically want toned arms and men want bigger muscles, so each gender has a different approach when it comes to achieving these goals. But in order to get any toning and or muscle definition, the weight first needs to come off. How is that achieved? By adjusting diet and doing arm workouts. Those pesky muscles on the back of the arms where you want to reduce arm fat are called the triceps. The triceps is not one muscle, but three (hence tri), so ideally you need to do exercises that target all three muscles to whatever look you’re after. 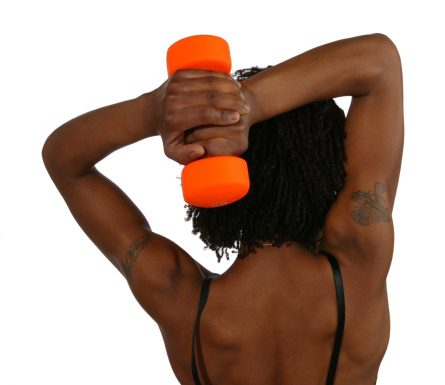 Below are three exercises for flabby arms that will help you achieve toned triceps. In this exercise, you’ll need some sort of heavy object to lift. Whether that’s a 15-pound dumbbell or a large bottle of soda or whatever is up to you, but start with something you can manage and then increase the weight as you get stronger. To start the exercise, hold the weight around its middle and behind your neck with your arms bent at 90 degrees. Lift it over your head until your arms are straight, then return to the starting position. Do three sets of 20 reps, or as much as you can handle at that weight. If you can’t lift it anymore, that’s called “going to failure,” and that’s OK, as you want to tax your muscles. With a chair behind you, grip the sides of its seat with both hands and lower yourself to the floor until your arms are bent at a 90-degree angle. Once there, lift yourself up using your arms. Do five reps to start, then build up to 10 and then 15 and so forth. This isn’t an easy exercise and it will likely hurt the first few times, so just do as many as you can and increase the reps from there. If you don’t have a chair that’s sturdy enough, you can also use a bench for this exercise. This exercise requires only you and your kitchen counter. If you can’t do a push-up from the floor, this is a good alternative to get you started until you can, since you’re not fighting against as much gravity as you would be from a horizontal position. Stand at arm’s length from the counter, with feet a shoulder-width apart. Place your hands on the counter and lean down, walking backwards a bit until you are on your tiptoes, but with arms still straight. Then lean in all the way to the counter until your chest touches it (or just about) and then push out. Do as many sets of 10 reps as you can. To target the triceps even more, place your hands closer together on the countertop. Alternatively, you can do this exercise against the stairs. of 10 reps as you can. Here’s the thing about fat reduction: you can’t target a specific body part. It doesn’t work that way. Arm fat is part of your body, so an overall approach is needed as opposed to dietary guidelines just for your arms. The rules are simple: watch what you eat and how much of it. You need to create a caloric deficit in order to lose weight, and as the weight disappears from your body, you’ll see a reduction in arm fat. Foods made with refined white flour. Instead, opt for fresh fruit and vegetables, lean cuts of meat, healthy carbohydrates (whole-wheat pasta instead of white pasta, sweet potatoes instead of white potatoes), and water instead of sugary drinks (you should also limit fruit juice intake). Avoid desserts in general, but you do need to treat yourself once in a while, or you’ll find it difficult to stick with a diet.